Most of us have learned how to make a few Irish recipes without even knowing it. When St. Patrick's day rolls around each year, I always say we all have a little Irish in our blood. The celebrating and partying way of life is in the blood and we all love a little excitement in our life. When it comes to St. Patrick's day recipes, we all think about corn beef and cabbage. Actually, I have been told that this dish is America-Irish. Anyway, I have cooked corned beef and cabbage for many years for St. Patrick's Day. Irish people learn how to make Irish recipes that are influenced mostly by the crops grown and the animals raised there. The early introduction of the potato to their cuisine has had a great influence in developing delicious Irish recipes. Cattle, pigs and sheep were raised through much of Ireland's history; these are often part of their menu. Until the nineteenth century this meat was a luxury reserved only for the wealthy. Of course the making of alcoholic beverages has had a great impact on Ireland's culture also. As I touched on before, potato recipes are the basis of most Irish meals. After beginning as small crops, the potato became the main food crop of the poor. It soon became the staple crop of Ireland. You will find potatoes in dishes like mulligan stew, lamb stew, Irish bread recipes and many dessert recipes. The local production of the popular Guinness beer is felt throughout the culture. Besides drinking, it is also used in the cooking of Irish recipes. The beer is characterized by its unique flavor and dark color. The Guinness cake has been made popular by this unusual beer. Ireland is also famous for its Irish whiskey. It is believed to be one of the oldest distilled beverages in Europe. Like the beer, the whiskey is also used in the cooking. Many of us are familiar with the delicious Irish cream. This cream liqueur has 15 to 20 percent alcohol in it and is good for flavoring many drinks and foods. The Irish whiskey has made the Irish Whiskey cake popular which is also known as the Irish wedding cake. Creme De Menthe is also popular in many Irish desserts and it is one of my favorites to use in frosting especially the cakes. Most of the Irish recipes contain the locally produced Irish butter. I must add that their butter is the best I have eaten. We actually did a taste test between several butters here at the farm with friends and the Irish butter won hands down. I have used the Irish butter for years and have not found any others as good. Many of the other Irish desserts are made with apples. Apples have been grown in Ireland for thousands of years. It makes good sense why many of their delicious dessert recipes have apples in them. Much like here in the United States they also have pies, cakes, fritters, dumplings and many others made with apples. Among the Irish recipes, I must mention the Irish soda bread. It is so delicious! This wonderful bread is enjoyed any time of the year but is a tradition on St. Patrick’s Day. It is crusty on the outside but cake-like on the inside and is great with any meal or anytime of the day. At various times throughout Irish history there have been very meager supplies of all wheat and oats. For this reason you will have bread recipes made with cornmeal, potatoes and other starches besides oats and the white flour such as in most soda bread recipes. HOW TO COOK RHUBARB Rhubarb is grown in Ireland and many Irish recipes are made from it. Spread rhubarb evenly in a greased 0 X 13 inch baking pan. Cream butter, 1 ½ cups sugar, flour, salt and baking powder alternately with milk. Spread mixture over rhubarb; combine remaining sugar with cornstarch and sprinkle over batter. Pour 1 cup boiling water evenly over all; bake 1 hour at 375F degrees. Preheat oven to 250F degrees. Combine and mix beef, potatoes, carrots and celery; place mixture in a casserole baking dish. Sprinkle top with sugar and tapioca; combine tomato sauce with water and pour over the top. Cover top tightly and bake for 4 hours; DO NOT LOOK UNTIL FINISHED. 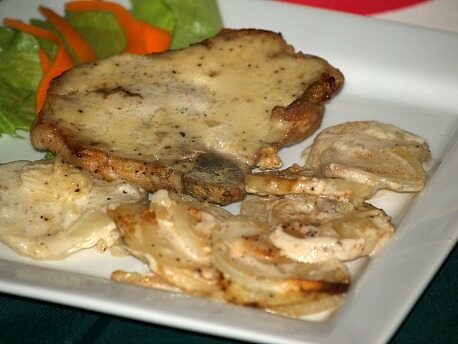 Season pork chops with salt and pepper; brown in frying pan in oil. Remove chops from pan; melt butter in pan. Stir flour into melted butter; slowly stir in milk and cook until thickened. 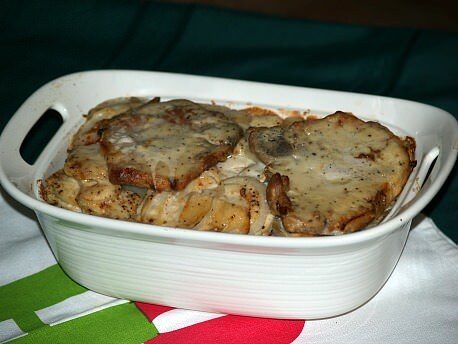 Place in a greased casserole dish in layers the potatoes, onions, cream sauce and pork chops. Combine flour, baking soda and salt in a bowl; add butter and stir slightly. Quickly stir in enough boiling water to make a soft dough. On a lightly oatmeal floured surface, knead until smooth. Roll dough to circle 1/8 inch thickness; cut circle into wedges. Bake wedges on an ungreased hot griddle on skillet until they are brown on both sides. Serve with more butter and jam. After grating potato pour a little fresh water over it; squeeze out water and put potato in a bowl. Let potato water stand until starch settles on the bottom of bowl; pour off clear water and SCRAPE off the starch. Combine starch, potatoes and dry ingredients together; add butter and enough milk to make a MEDIUM FIRM dough. Knead lightly on a floured surface; divide dough into 4 parts. Flatten each part of dough into cakes about ¼ to ½ inch thickness; score into quarters but DO NOT cut through. Bake on ungreased baking sheets for 40 to 60 minutes until crusty.